Today, the Maine Centennial Commemorative Silver Half Dollar Coin remembers the memorandum of agreement between the United States and Great Britain on February 27, 1839 to negotiate the disputed lands between New Brunswick and Maine. On orders from the President, General Winfield Scott played an important role in achieving “peace with honor” in resolving the dispute. It was General Scott’s intention to accompany the Indian emigration farther west, but receiving information that the Canadian insurgents were making renewed attempts on the Canadas, he was directed to proceed at once to that frontier. Passing through the States of Kentucky and Ohio, accompanied by Captain Robert Anderson, he called upon their respective governors and arranged for the calling out of volunteers should they be needed, and also gave proper instructions to the United States marshals and district attorneys for such duties as they might be called upon to perform. He passed on rapidly to Cleveland, Sandusky, and Detroit, and met great assemblages of excited citizens, and, by his appeals and reasoning with them, prevailed upon them to desist from any acts in violation of the neutrality with Great Britain. Pending these important services, he learned of the trouble which had arisen between the State of Maine and the British colony or province of New Brunswick, and at once made haste for Washington. On his arrival at the capital, after reporting to the President, he was called before the committees on foreign affairs of both Houses of Congress, before whom he urged and succeeded in securing the passage of two bills — one authorizing the President to call out the militia for six months and to accept the service of fifty thousand volunteers, and the other to place to his credit ten millions of dollars. The President replied, “Peace with honor”; and the general, who fully reciprocated the President’s feeling, took his leave, accompanied by Captain Robert Anderson and Lieutenant E. D. Keyes, his aid-de-camp. He left with general instructions, but in certain events he was to act on his own judgment without restriction. He was then given a reception by the Legislature, and received on its behalf by Robert C. Winthrop. From Boston he proceeded at once to Portland, where he found the people greatly excited, and demanding the immediate seizure and occupation of the disputed territory. At the capital, Augusta, where he next proceeded, he found the same excitement with the same demands. The Legislature was in session, and a large majority of its members were for war. The strip of disputed land was valuable chiefly for ship timber. Some British subjects had entered the territory and cut some of the timber, and the Governor of Maine sent an agent with a posse to drive them off. The British seized and imprisoned the agent, and much angry correspondence followed between the authorities of both sides. General Scott soon determined that the only mode of settlement was to prohibit or have an agreement on both sides to leave the territory unoccupied by either party until the matters in dispute could be arranged between the governments of the United States and Great Britain, taking the matter out of the jurisdiction of the State of Maine and the province of New Brunswick. Previous to Scott’s arrival in Maine the Legislature of that State had passed an act placing eight hundred thousand dollars at the disposal of the Governor and authorizing the calling out of eight thousand troops. Some of these troops had been organized and moved near the disputed territory, and others were held ready to move when ordered. British troops, both regulars and militia, had also been moved forward. On February 27, 1839, President Van Buren had sent a message to Congress transmitting various documents received from the Governor of Maine, and a copy of a memorandum signed by the Secretary of State of the United States and the British Minister to the United States, which, it was hoped, would prevent a collision of arms. Mr. H. B. Fox, the British Minister, had acted without specific authority from his Government, and the memorandum therefore had only the force of a recommendation. All correspondence had for some time ceased between the governors of Maine and New Brunswick. The Governor of New Brunswick, John Harvey, had been an adjutant general of one of the armies of Canada in the campaign of 1813, and was well known to General Scott. Scott, it will be remembered, was an adjutant general in this campaign, and he and Colonel Harvey had frequent correspondence, and it was so conducted as to create a feeling of respect on both sides. At one time in the campaign mentioned, when Scott was on a reconnoitering expedition, his party came upon Harvey, and a gun in the hands of a soldier near Scott was leveled on him. Scott caught the gun, and said, “Hold! he is our prisoner,” but Colonel Harvey made a rapid turn and escaped. On General Scott’s arrival in Maine he had with him a private letter from Sir John Harvey, the Colonel Harvey just mentioned, then Governor General of New Brunswick. It is proper to mention here, as additional reason for good feeling between General Scott and Sir John Harvey, that at one time in the War of 1813 an American soldier under Scott’s command had come into possession of the uniform coat of a British staff officer, and in one of the pockets was found the miniature of a young lady. Scott purchased these articles from the soldier and sent them to Colonel Harvey. The picture was that of his young bride, then in England. Governor Fairfield, of Maine, had on March 12th sent a message to the Legislature objecting to the terms of the memorandum, but recommending that, when fully satisfied that the Lieutenant Governor of New Brunswick had abandoned all idea of occupying the disputed territory with a military force, or of attempting the expulsion of citizens of Maine, he [the Governor] be authorized to withdraw the military force, leaving the land agent with a posse of armed or unarmed men, as the case might require, sufficient to drive out or arrest trespassers. The Legislature on March 20th passed resolutions in accordance with these recommendations. The message of the Governor of Maine and the resolutions of the Legislature required the lieutenant governor to make the advance. General Scott, after the action of the Legislature above mentioned, sent a reply to Harvey’s private letter, which he had held unanswered so long. This elicited a friendly reply, and other letters of the same character quickly followed on either side. A line of couriers was established between them to facilitate correspondence. Governor Harvey took the first step, and made the concessions which were necessary to appease the authorities of Maine, but the Governor did not feel authorized to withdraw the troops from the disputed territory unless authorized by the Legislature. General Scott mingled freely with members of the Legislature, urging pacific measures, and on March 20th resolutions were passed; and Scott having his memorandum with Sir John Harvey with all concessions to restore tranquility, the Governor of Maine added his approval, and the question was transferred to the authorities of the United States and Great Britain, which resulted in a satisfactory settlement to both nations of this un happy affair. 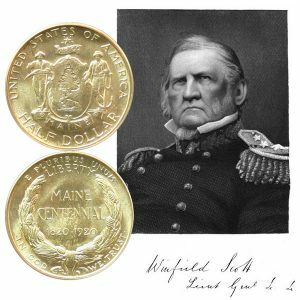 The Maine Centennial Commemorative Silver Half Dollar Coin shows with an image of General Winfield Scott.